Halloween is getting closer by the day and with school parties and trick or treating, your child will want a costume. Have you ever thought about making your own? 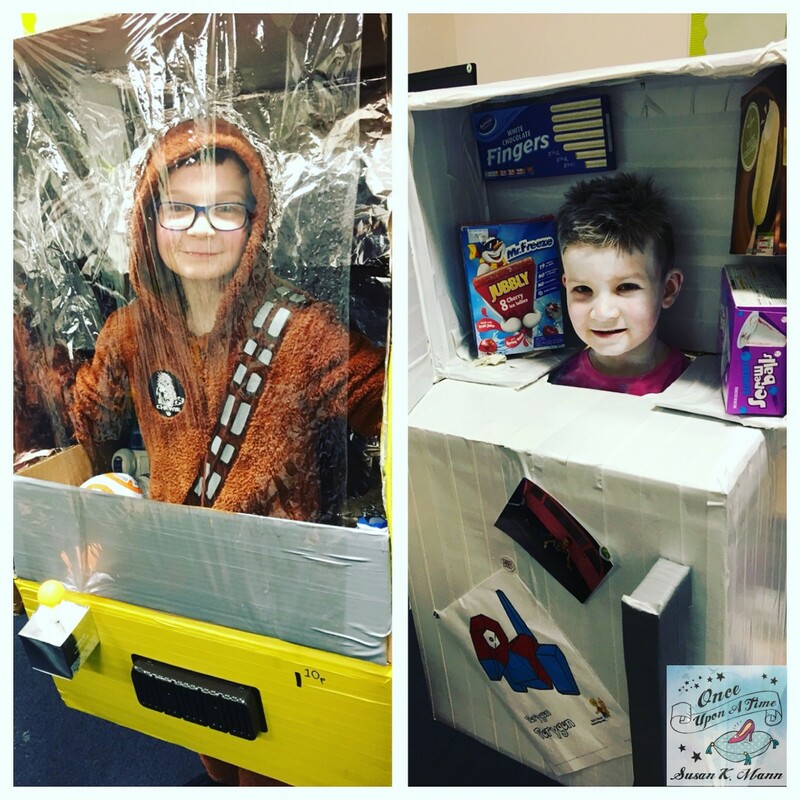 My kids love these last minute cardboard box costumes we’ve made over the last few years. 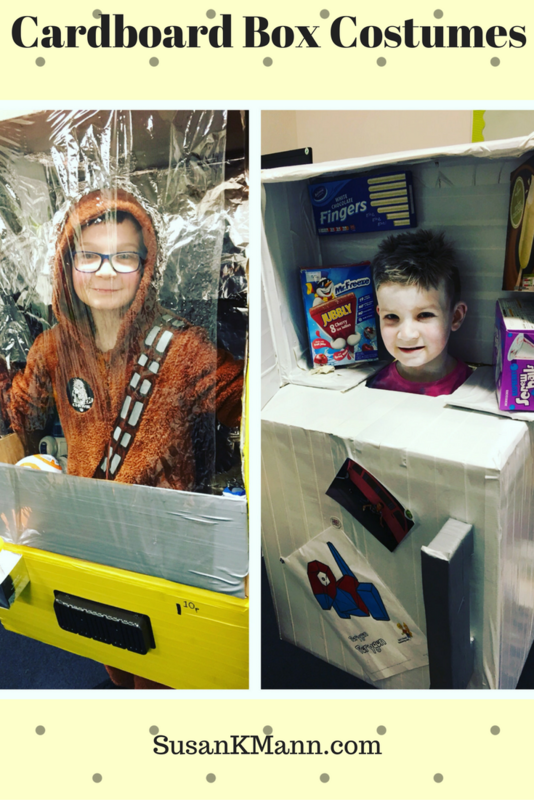 Cardboard boxes aren’t just for Halloween, these can be used all year round. If you haven’t purchased a costume yet, it’s never too late to make your own. Making things from a simple cardboard box is easier than you think and the possibilities are endless. All you really need is some cardboard boxes, scissors or craft knife, duck tape and some imagination. They are simple and quick. Give it a go, honestly, anyone can be creative! Get your simple cardboard box and let the fun begin. 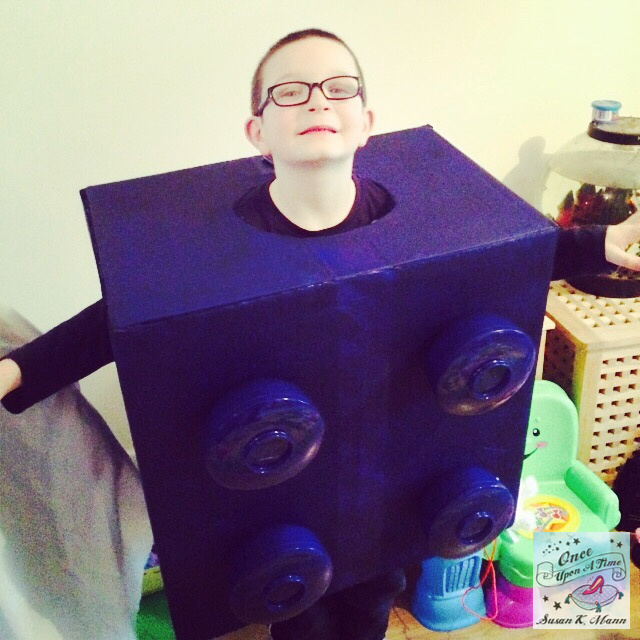 The first year we did cardboard box costumes we made a lego brick. Before I started using duck tape I used paint. It is fine if you don’t have any duck tape, but it doesn’t give as good an effect and takes so much longer. To make, tape up your cardboard box. Cut a larger hole in the bottom of the box, this needs to be able to fit your child’s shoulders. Then cut a smaller hole for your child’s head. You want it to be able to stay on, so you need to make sure it’s not too big. Cut out holes for the arms to help balance. Now you’re ready to paint or tape. Colour in your box one colour. I used some noodle pots for the sticky out bits for the lego brick. They worked perfectly. They are the dragon noodle boxes. This is a great costume for all ages. 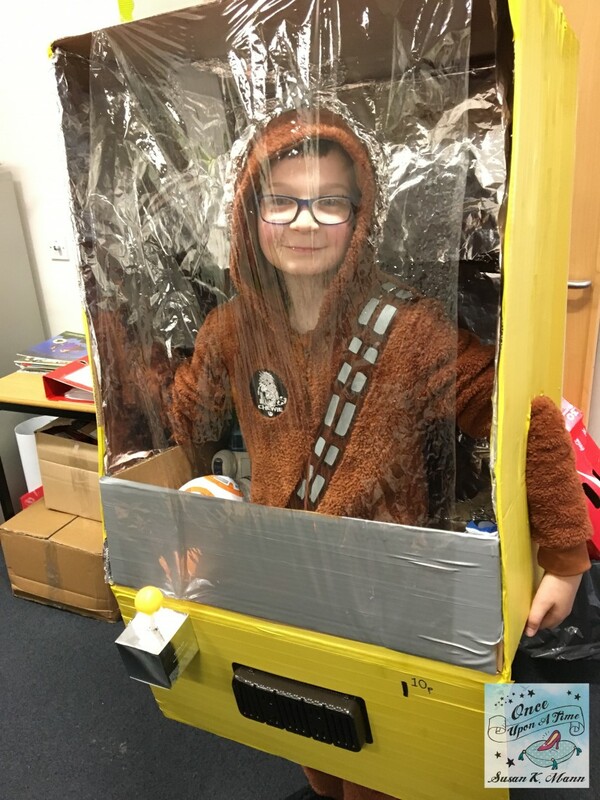 The following year Tyler dressed up as a vending machine. This was a truly brilliant costume and again easier than you think. Again, it would have looked so much better with duck tape rather than paint. Live and learn, is my motto. 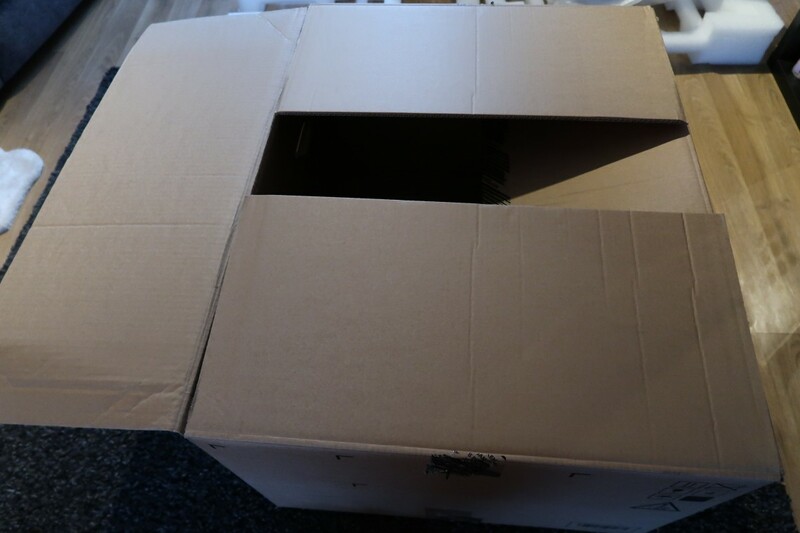 Cut out your cardboard box similar to the Lego Brick with the exception of leaving the bottom open so you can use it as the lap at the bottom. I cut out the middle of the box at the front. Inserted a smaller box, glued in using super glue or a hot glue gun, I need to invest in one. I added in shelves with cards and glued in empty packets of snacks. The front of the shelves is actually a clear plastic folder front. Or you could use a laminating sheet or cellophane, which you can get in loads of places cheaply. Tops tips are to keep things light, kids have difficulty carrying boxes as they get heavier. Stick on or print off the extras and good to go. 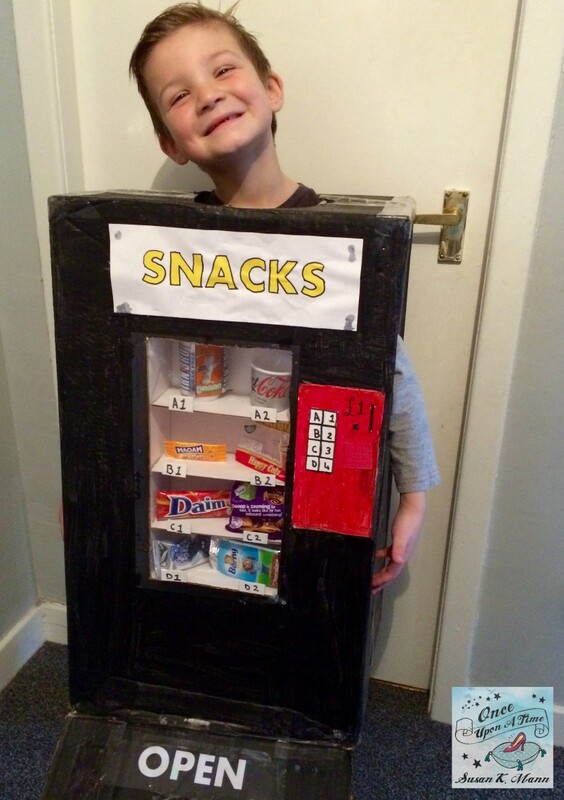 My vending machine won the best costume at the school activity day. This was the easiest costume by far, keeping the litter on was my only challenge. If I had a hot glue gun, note to Santa, it would have been so much better. I spraypainted this box blue, but again, duck tape would have been simpler and I wouldn’t have a blue slab in the back garden. I did use duck tape for the recycle sign. I cut it out and stuck it on. I’d bought duck tape for Tyler’s costume last year. This one was Lucas costume. 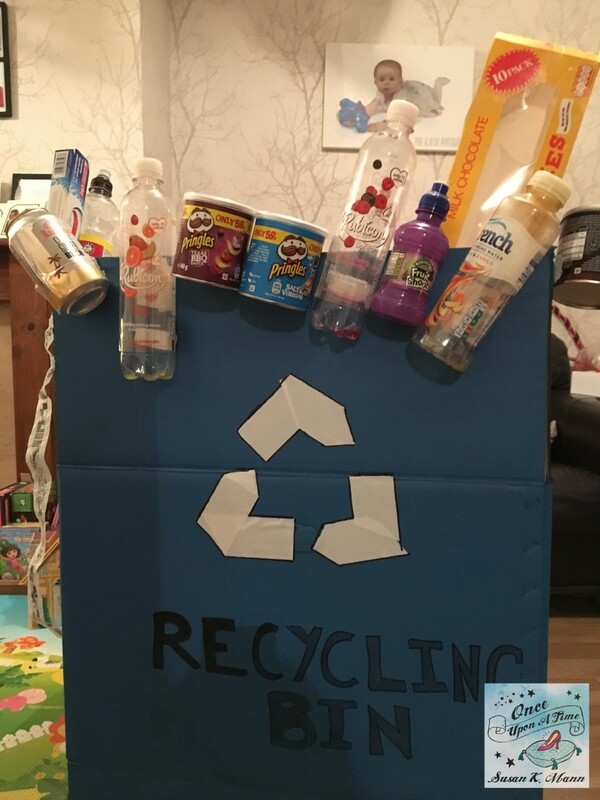 Stick on the recycling items and your good to go. Simples! Popcorn was another costume that was so easy to make but looked fantastic. This was my first time using duck tape. I got the box and cut off all the flaps. Then put red and white alternative stripes of duck tape along the box lengthways. Added on a popcorn sign that I printed off. 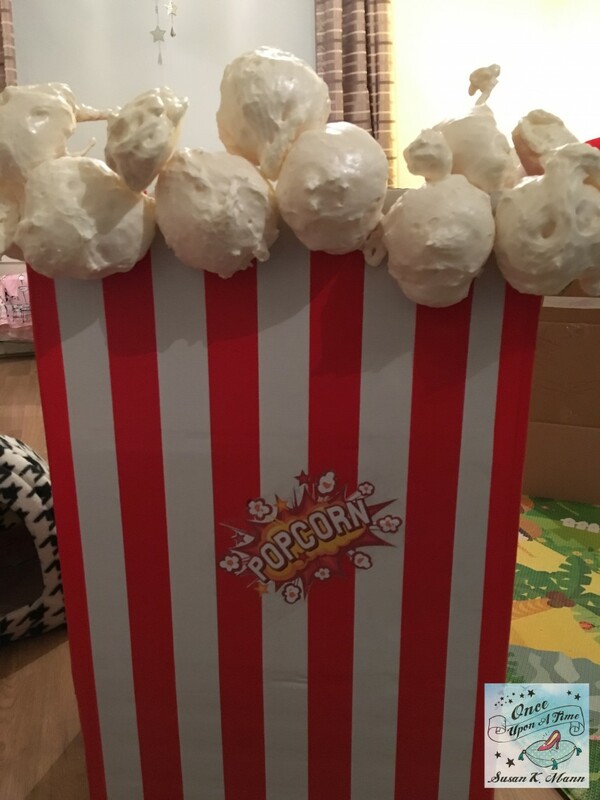 The popcorn is actually made from a cheap tin of expandable foam. I set out some greaseproof paper and then added dollops of expandable foam. Left it to set overnight and glued them on to the front of the box. To allow my kid to hold onto the box, I glued polystyrene arms onto the inside from the packaging that comes with boxes. However, braces work just as well. Tick elastic glued onto the box works just as well. They turned out well didn’t they? 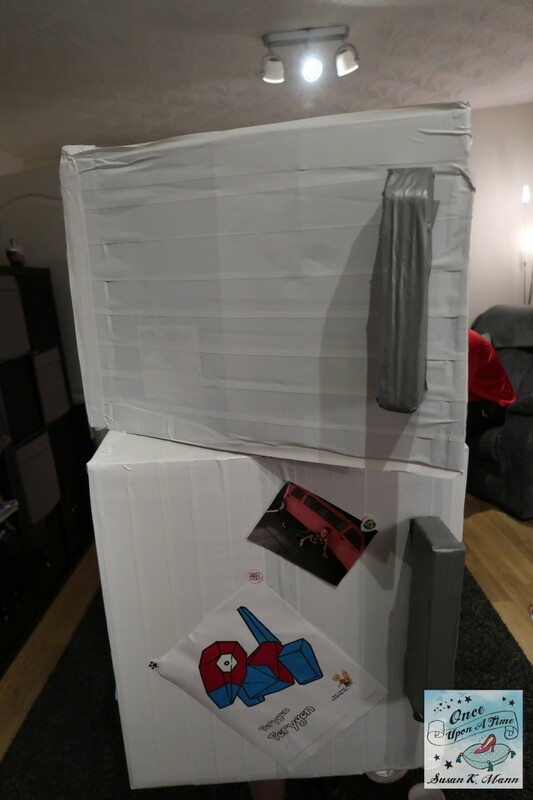 This year the Halloween costumes ask from Tyler was a fridge. Goodness, I thought, how on earth? Well, I did it. two server boxes from work. Sealed the bottom one with tape and covered with white duck tape. Cut out a larger hole at the bottom for Tyler’s shoulders and then the top for his head. I added another box to be the freezer. I used the front of the box as the door to the freezer. Then covered it with white duck tape inside and out. The duck tape makes it sturdy as well as looks great. I used 1 large roll and 3 small rolls of duck tape for this. For the handles, I used the polystyrene packaging and covered it with silver duck tape. Then inside I stuck empty frozen boxes. I covered his head and hair with white face paint. Added a few coloured in drawing with stickers as magnets and it was good to go. This was the trickiest one to date. This was a large cardboard box. I cut two holes for his arms to fit through. The bottom one I left as a flap. He is inside the machine so no need for the top one. I cut off the front of the cardboard box. I covered the outside with yellow duck tape. I used two rolls. The inside I lined with tinfoil. I used another bit of cardboard as a shelf at the bottom. to hold the teddies on. I used an old perfume box, pen and ping pong ball to make the joystick. 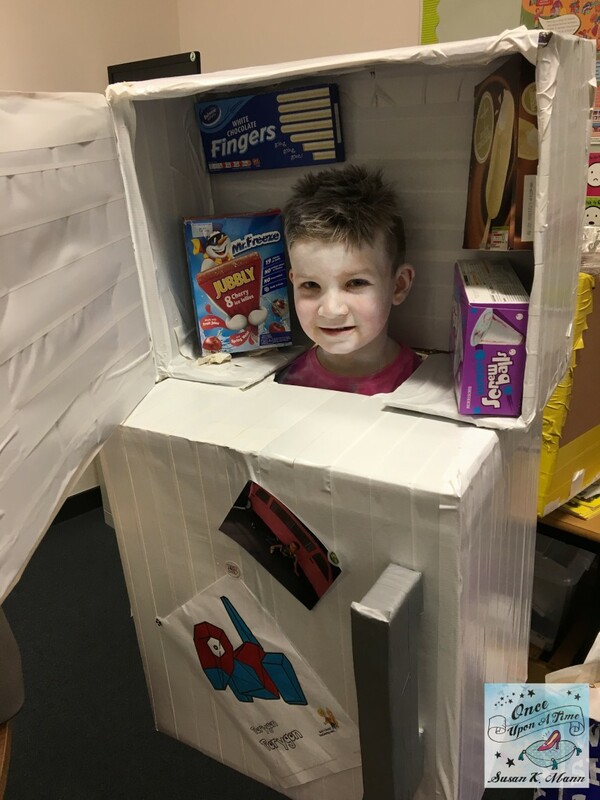 Drew on the money slot and used the inside of a chocolate fingers box for the pretend door. The front I covered with cellophane. Lucas dressed up as a wookie so it was as if he was a teddy bear. I made the claw part out of tin foil and stuck another part on at the rest of the claw. I moulded the claw around Lucas’ head as if he was caught and the rest resulted in a win at the school party. Here are my two boys costumes for this year. What do you think? 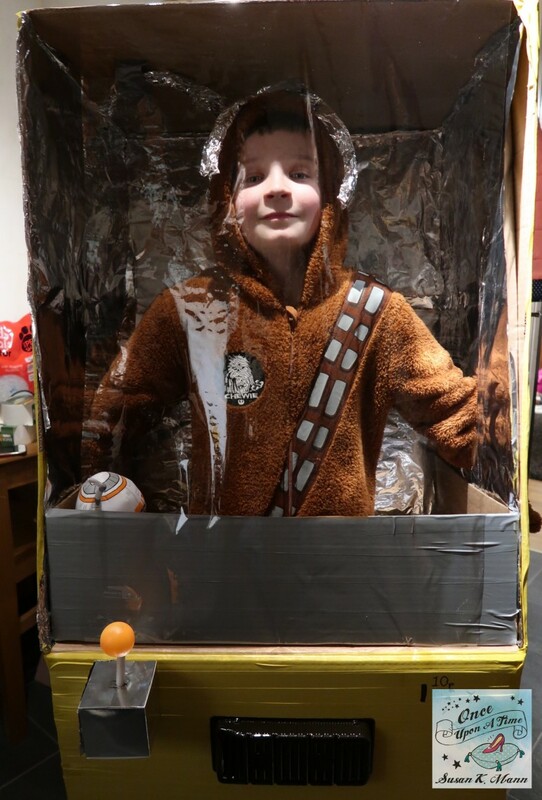 These cardboard box costumes are simple, affordable and they look great. There are so much possibilities to make and although I said my usual never again, I know next year I will be back making them. So watch this space for additions. 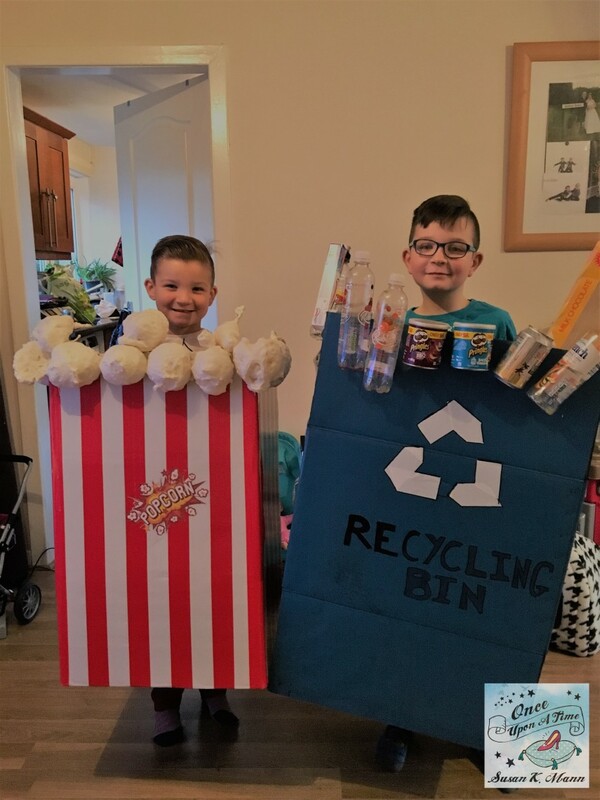 I’d love to know if you’ve made any cardboard box costumes? Or you’d think about making these? Let me know in the comments below. I just love these costumes so much! I’m in awe of both your imagination and your creativity. The boys are very lucky to have such a talented mum! It truly is amazing what you can do with a cardboard box. We have so many of them through our house, I should make better use of them. It look amazing! I have not challenge myself making those. I will probably pass it! Well done! 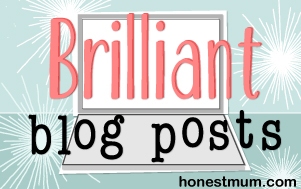 What a brilliant post! I love this! You’re so talented, I wouldn’t know where to begin. I absolutely love all of these costumes but the last two are definitely my favourites!